You've heard of it before, the much loved Italian cheese called Asiago. Well, we went to the town for which it is named. The family I was traveling with has relatives in the town of Asiago and we went to visit some of the remaining family members. It was a nice change of scenery: from the lake to the mountains, East to Vicenza and then North on a winding little road to the foothills of the Alps and the cute little town made famous by cheese. The scenery changed dramatically during two hour-drive. I looked out the window and saw beloved mountains (which I miss so much as a Colorado girl living in the South) and green hillsides, the architecture resembling more Switzerland than Italy. This region is actually not far from the border of Austria. In some ways, they have more in common with their neighbors to the North than with Romans or Southern Italians. In addition to meeting with some relatives and meticulously going over the family tree with sweet people whose memories have seen better days (a great challenge for my interpreting skills), we had a wonderful local guide named Stefano. He spoke near perfect English and took us to his father's trattoria for dinner the first night where we ate little colorful gnocchi and other handmade pastas and cheeses from the area. The place was very big and so much work goes into the production of cheese! It's a long process with many different steps for most varieies, as the aging in particular temperatures and water brines is what gives certain cheeses their taste and value. In this factory they make not only Asiago, but also the prized Grana Padano (which is aged a minumum of 6 mos. and up to 2 years), provolone, mozzarella, ricotta, and others that I had never heard of. Seeing the complexity of it all and the amount of equipment and raw materials needed, not to mention the human labor, since a lot of it is done by hand and not just by machines, makes you wonder how profitable cheesemaking in the old-fashioned way really is for these people. Despite the fact that this was one of the biggest cheese producers in Italy, they still do things in a traditional way. For example, the milk is brought in every morning very early from cows that live in the nearby hills and is transferred from trucks into huge vats with pipes that then send the milk inside to be used in that day's operations. This happens every single day, except Sunday. You don't make cheese with anything but the freshest milk. And men are required to stir the huge copper vats with special tools that take each round of cheese and roll it up the sides forming the perfect wheel of grana padano. We asked if there wasn't a machine that could do this and they said, "No, it can only be done this way." We tasted this fresh ricotta, just made and still warm. It melted in your mouth and was like no other ricotta I've ever tasted. And, at the end of the tour, we were led back to the little shop and given a generous sampling of the cheeses we had seen along with some local wines of course. It was remarkable to me that we were led around by the head honcho, the director of operations, the main cheesemaker himself, who also then raised a glass with us. And this on a day when he explained that a co-worker had died recently and a lot of workers were away at the funeral and he was needed all over the plant. It means that no matter how big or how small you are, in Italy the abilitly to welcome strangers and take the time to show them firsthand why you are proud of your heritage is what makes them truly special people. I can't imagine being treated this way at Kraft or Monsanto. And what's more, the cheese was really, really good! This night was one of my favorites of the trip. Yes, we stayed in the most beautiful hotels, and yes, we ate in exclusive restaurants and drank fancy champagne, but for me the cooking lesson and dinner at Dora's was one of my favorite things. We arrived and she put us to work immediately. There were 5 of us girls plus Dora, and the agenda was 'risotto con zucchine e fiori di zucca' (risotto with zucchine and their flowers). First, because nothing is ordinary in Italy although the cuisine is rather simple and depends on the finest ingredients, we made little "cialde" or baskets out of parmigiano cheese in which to serve the risotto. First, heat your pan until very hot and add freshly grated parmigiano (about 100 gr per basket). It will come together pretty quickly into the shape of your pan so choose one that is similar in size to the basket you want to end up with. As soon as it is done, lightly browned and uniform, take it out carefully with a spatula and lay it over an upside-down bowl to form it while still hot. Once hardened into the shape of the bowl, remove and repeat the process for each basket. Yum! a parmesan cheese bowl to eat when the risotto is gone! What could be better? How about fried stuffed zucchine flowers? A perfect garnish for this dish, but also one of my favorite summertime treats. For the flowers, first trim off the stems and pistons inside each flower. If you have to slice it open to get them out, do it carefully so as to not ruin the shape of the flower too much. Then each flower is stuffed with a piece of provolone or mozzarella cheese (we used provolone) and if no one objects, it's traditional to put an anchovy in the middle of each one. We opted for no anchovies, but they are delicious either way. Then, using a batter of flour and cold beer (the beer, we learned, makes them lighter and also prevents the oil from sticking to them), dip each one in the batter and drop into your very hot vegetable oil. Dora uses one that is part sunflower and part vegetable oil. Now for the risotto. This is a very easy risotto recipe. I've made them many times before and the main difference here for me was all about the ingredients, mainly the butter. I learned that in the North of Italy they have a special type of butter called 'Burro Soresina" from the freshest milk of Italian cows only (it says so on the label) and contains 85% fat (!!) It's the highest percentage of fat content you can sell and still be legal. And it makes your risotto extra creamy and so good. What a revelation. Another reason for the extra creamy goodness of this risotto was the type of rice we used. It's called 'vialone nano' and, unless you are a professional chef (or just an Italian houswife) you may not have ever heard of it. There is arborio (which we commonly use in the US for making risotto) and then there is vialone nano (for creamy vegetable risottos like this one) and carnaroli (for seafood and other less creamy kinds). The rice you can get in Italy is far above the quality of the rice we can find here. I am now going to have to order it in bulk on the Internet because I've been educated on the vagaries of rice and their uses. I love the specificity of the Italian cook's pantry. Now, back to our risotto. We used very small zucchine which made the cutest little rounds when sliced very thinly. We used about 2-3 lbs of zucchine I think. Melt about 3 tblsp. of the finest butter you have, with 2 cloves of garlic, until foamy. Then remove the garlic and add the zucchine. Sautee until browned a bit, or a few minutes. We didn't use any onion in this recipe, but we did throw in some 'erba cipolline,' a small little herb that looked like chives. At this point, add about 1 cup of white wine, or if you happen to be drinking prosecco like we were, add that. It does't matter as long as it's not red, which would color your rice pink. Now for the stirring. A risotto requires almost constant stirring and adding broth (vegetable) which you have heated on the stove next to the burner you are using. Each time the rice absorbs the liquid, add a ladel of broth and stir and continue this until the broth is gone and the rice cooked al dente. This will take at least 20 min., maybe a little longer. When the rice is done, add a big handful of fresh grated parmigiano cheese, stir, turn off the heat and add more of that delicious butter, stir and let sit while you prepare your bowls. It's important to let it sit a few min. before serving, though it does need to be served very soon after finishing. Fill each cheese basket with risotto and garnish with a fried zucchine flower. For this meal, Dora also served a 'vitello tonnato' that she had whipped up earlier in the day, a classic Italian summer dish because the veal is served cold with a tuna mousse; and a frittata with zucchine and mixed salad after that. We drank some lovely wines from the region, local wines from Garda like Bardolino "le Nogare," a light red; Groppello, a deep, rich red to follow; and Franciacorta "Ca del Bosco" a fantastic sparkling white made using the Champagne method right down the road from where we were staying. Cookies and Limoncello (another local specialty made with the huge, sweet lemons grown near Lake Garda) were a perfect ending to a beautiful meal and cooking lesson. Grazie ancora, Dora e Gianfranco! The first leg of our journey we spent in the lakeside town of Sirmione on Lake Garda. It's a small, quaint town 40k West of Verona with a Medieval castle right next to a five-star hotel. All of which makes for a splendid 'room with a view'(above). The reason for staying in this town, apart from the beauty of Lake Garda, is its proximity to my friends' relatives who live in a nearby town. Gianfranco and Dora and their family are some of the nicest people I've ever met. They are the epitome of Italian hospitality and when the Americans come to town, they open their home to us with wonderful dinners and late nights enjoying each other's company. Our second night in Italy we were invited to the family's lake house. In the winter they live in the city of Brescia; summer weekends are spent at the lake. Dora told us she had made a little something: just handmade ravioli, 3 different kinds. These ravioli were unlike any I've had before. They were a beautiful bright yellow-orange color (most likely due to the quantity and high quality of Italian eggs) and very thin, their stuffings of spinach and ricotta, meat, and pumpkin faintly showing through the pasta. They were sauced ever so lightly with butter and sage and were shaped not like typical ravioli, but were twisted on each end like little candies, or "caramelle." So delicious. I would love to make ravioli like this. roasted peppers and sweet red onions. Oh, and a little caprese salad with capers and fresh basil. No big deal. Just a little something she threw together. Dora is my hero in the Italian kitchen. She reminds me a little bit of my mom. And the food that comes out of her tiny, modest kitchen belies the serious cook she really is. Her husband, Gianfranco, is like the Italian uncle I never had. He's a big, smiling teddy bear, who happens to pour really good wine. To say I had a great trip would be such an understatement. To say Italy was beautiful as usual and the food wonderful, all seems like stating the obvious. We had so many memorable meals and saw such lovely places in one week that it is hard to believe now that it happened. So I will start by just giving you some of my favorite images. The explanations and the detailed accounts of the best meals and places will come. But for now I just want to savor these while they're still fresh and before they become just visual souvenirs. I am off to the Lakes, and not just any lakes. I will be leaving for Milan for an unexpected week-long trip with family friends. 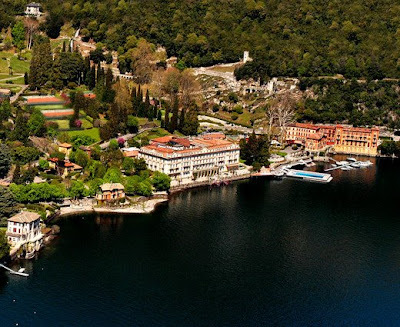 We will be visiting Lago di Garda and Lago di Como, as well as the town of Asiago to see relatives of my friends. A longtime friend and her family are bringing me along as their personal translator, a job which I will execute with gusto. So, technically, you could call this trip "work," though if you call sipping campari by the lakeside pool at the Villa d'Este work, then I'm your girl! I hope to bring back many photos and stories of the trip, as well as replenish my stock of Italian goodies to share with friends. It has been 2 years since my last trip to Italy and my supplies are exhausted and my language skills in need of refreshing. What could be better than a piece of toasted brioche with homemade blackberry jam. We spent the 4th of July in the country at Cedarwood, my boyfriend's family house in Hickman county. It's the perfect place to just relax on the porch sipping a beer or go down to the creek and dip your feet in the water. And our timing was impeccable because it's also the perfect place to pick blackberries! In Tennessee this time of year the blackberries are exploding and you can pick them on the side of the road nearly everywhere where there is a cleared, overgrown sunny patch. I'm told it's a 'trash plant' or a weed that takes over in this climate. Lucky for us! One man's trash is another woman's breakfast. It doesn't seem like a recipe is really needed to make jam. But I consulted a recent bon appetit column by one of my favorite bloggers, Molly Wizenberg. Hers was simple: about 30 oz of fruit, 2 cups of sugar, 2 tablespoons lemon juice. I used a little more fruit and a little less sugar and didn't do the proper canning--heating the jars and sealing them afterwards. With this small amount of jam I knew we'd eat it quickly with no need for preserving. If I were making large quantities, I would do it the old way. After washing the berries, combine them with the sugar and lemon juice and let them macerate for about 2 hours, stirring occasionally. Then in a saucepan over medium heat, bring the mixture to a boil and stir; then turn down heat and mash the berries with a potato masher and simmer for about 20-25 minutes until it becomes a thick purée. How to test when the jam is done cooking: put a spoonful on a plate, put it in the freezer and retrieve it after 5 min. If it gels and bounces back when you touch it, it's done. If not, simmer a bit longer. Spoon into clean jars and let sit at room temperature until completely cooled. Store in the refrigerator. I grew up eating homemade preserves made by my mother's aunt and uncle in Colorado. I remember their apples, peaches, pears and tomatoes and how they tasted of some old-fashioned goodness. They canned a lot of fruit --I assume from their own fruit trees-- and we were the lucky recipients of their labors. I have only recently begun to appreciate these efforts as someone who tries to eat seasonally and locally. And what a perfect example of a local food tradition this is: pick blackberries on Friday; make jam on Sat. and enjoy it on Sunday. And it's easy! If only I'd had about 5 more lbs of fruit I would have made jam for everyone. Next time I'll endure the heat and prickly bushes a little longer if only to be able to eat homemade jam more often.